Solid Fir Potting Bench with Recessed Storage Made From Kiln Dried Solid Fir This sturdy potter's bench features spacious upper and lower tiers for use as storage, work surface, or to double as a patio buffet table. A latticed table top keeps mess away from surface area, and allows excess soil or garbage to be conveniently collected in space underneath. This recessed space can also become convenient storage. Both sides of the table top are removable for easy access and cleaning. Made of kiln dried solid Fir wood, the table is pleasantly scented and is suitable for both indoor and outdoor use. Can be painted or re-stained. Partially pre-assembled, only minimum amount of assembly will be needed. 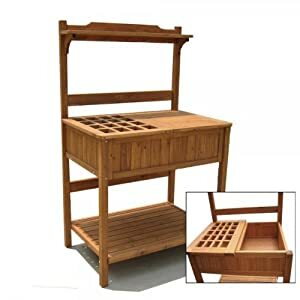 Features: Features Spacious Upper and Lower Tiers 24" D x 37" W x 60" H Made of kiln dried solid Fir wood Easy Assembly Can be painted or re-stained Instruction & Hardware included Makea a great greenhouse shelf as well Cover the table in inclement weather to maintain its natural beauty for years to come. Wood is kiln dried and treated with natural stain colors to enhance the appearance and durability of the piece Ships Quickly!